Army Mil-Spec NBC Cap with valve system for hydration while wearing military Gas masks. Made of Polypropylene, rubber and stainless steel material, the cap enables a user to drink from a standard military canteen while wearing PPE. 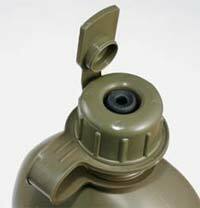 Fits GI 1 and 2-quart and NATO standard 28mm thread military canteens. Adapter has a pressure valve fitting gasket, cover, and a coupling with a self-sealing valve. Receives the drinking hose from any NATO standard military gas mask like the M17A1, MSA Millenium, M-40 and MCU-2P. Dimensions: cap: 1.85" diameter. Cap height: 1.36", Snap height: 2 5/8" (inches). NBC is an acronym for Nuclear, Biological and Chemical. MIL-C-51278D. Olive Drab. NSN 8465-00-930-2077. This item cannot be exported or shipped to APO, FPO addresses due to ITAR Regulations.